If you visit any southern food stand in Bangkok, you will see Kua Gling displayed in a large bowl. The dried yellowish meat looks unassumingly harmless. Grab a seat and order Kua Gling. The first bite, you will thinking you've made a mistake ordering something too hot to eat. But you want to continue because the flavors are so good. If you keep on eating, you will enjoy it with tears in your eyes. And the Kua Gling that you just had is not as hot as the one you'll find in the south. It's made mild to fit the Bangkokians' palate. 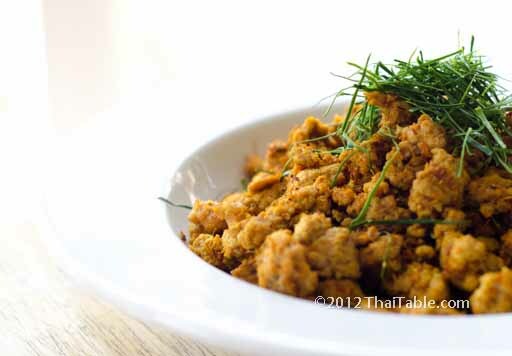 Among the most popular of southern Thai dishes, Kua Gling is extremely easy to make. The term 'kua' refers to dry roasting in a pan or wok over low heat while constantly stirring. 'Gling' is the act of rolling. The heart of this dish is dry meat packed with burning heat and southern spices with the aroma and flavor of kaffir lime leaves. Kua Gling can be made with a variety of meats such as beef, pork, pork soft rib bones, seafood and frog. The most common are pork and beef. To lessen the fire in your mouth, Kua Gling in southern Thailand is served with (ผักเหนาะ) a tray of fresh southern leafy vegetables, stinky beans and cucumbers. In this recipe, we want to bring southern food with the level of heat that is comfortable to you. With the homemade southern curry paste, you can adjust the heat by choosing mild peppers instead of fiery hot ones. You'll still get all the spices and flavors. 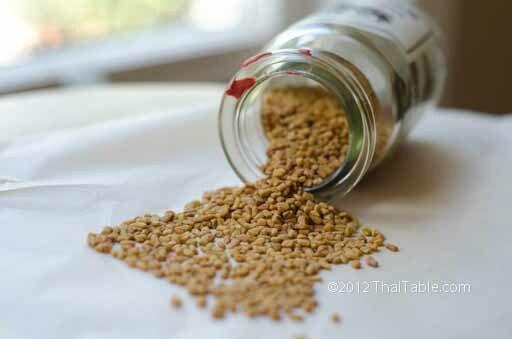 Fenugreek is an old Thai herb that I just discovered closer-by than I'd realized. I have known and used fenugreek in my Indian cooking for years without appreciating that it was the same as 'loog sud'. I'd also always associated the spice with old Thai clothing care more than cooking, so I couldn't put the two together. In the palace, where noble girls learned the arts of being a proper Thai woman, caring and scenting clothes was part of the work. Clothes were boiled with fenugreek, other herbs and fragrant flowers, dipped in wax, dried, scraped, pleated and folded into the desired shapes. Fenugreek gives out cloudy slime when boiled or heated with hot water which binds into the fabric when dried, similar to starch that we use today to harden and keep our clothes smooth. Each household/palace had their own formula for a distinct scent. It was said that the beautiful scent from a palace lady's clothes remained long after she had left. Researchers in Thailand credit fenugreek with lowering blood sugar and increasing milk production in nursing mothers. In Thailand, fenugreek is available at traditional pharmacies and spice stores. 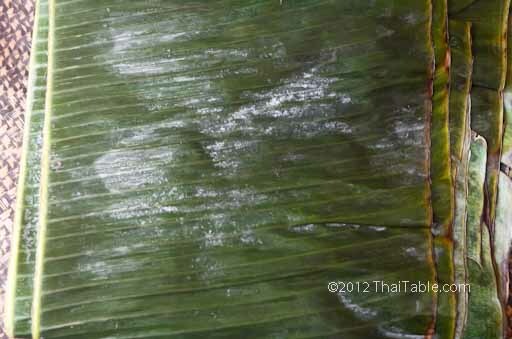 Banana leaves are magical; this versatile, environmentally friendly material permeates everyday Thai life. Thai people transform a simple leaf into containers and food wraps. Prior to non-stick clothing irons, the hot iron was pressed onto a fresh banana leaf to clean it and help it glide better. Mackerel (ปลาทู) is wrapped in banana leaf before the final wrap of newspaper. Haw Mok (curried fish) is steamed in small banana leaf containers. Sticky rice with banana is wrapped in banana leaf and steamed. Banana leaves are stripped and folded into elaborate ceremonial containers. After moving to the US, I stopped relying on banana leaves for my cooking needs because banana trees didn't grow in my backyard and I couldn't find leaves at the market. Recently, I have found the banana leaves in the freezer at many local markets. So, banana leaves are back in my kitchen again. This reopens opportunities for me to cook many more dishes authentically. There are a few techniques when using banana leaves in cooking. Red Rice has become an addiction for me. It started when we all wanted to get healthy and tried the different types of rice. I loved the color of the rice and first selected it purely based on aesthetics. It was not easy to get everyone in the household to shift from jasmine rice to something different. Also, cooked red rice is not as tender as milled jasmine rice that I was used to. So, I started out with just a handful of red rice mixed with jasmine rice. The red rice stood out amongst the white grains, looking just beautiful. Slowly I increase the red rice to jasmine rice ratio but just enough to still keep the rice tender. Now, I'm comfortable with 50-75% red rice to jasmine rice. I'm now so used to eating red rice now that when I eat elsewhere, it seems like something is missing. The Red Rice has a nutty flavor and chewy while jasmine rice us soft and gummy. To get the benefits of both types of rice, this recipe has 50% red rice and 50% jasmine rice. The result is soft and colorful rice with the bran benefit. The term 'Red Rice' translated literally in Thai is 'Kow Dang' which refers to all types of brown rice. However, the variety imported into the US, is known in Thailand as Kow Mun Pboo. 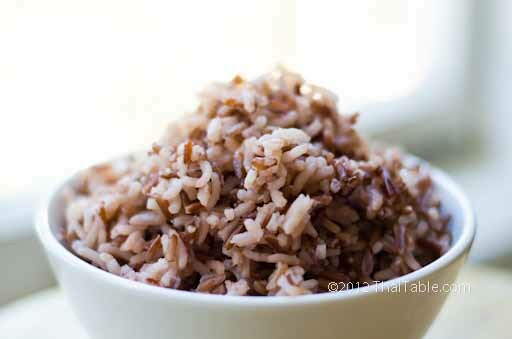 Red Rice has a long, skinny grain with a deep red, almost brown bran. The rice is milled to remove the outer husk but the outer skin layer or bran is not polished off, unlike with white rice. If you break a raw rice grain in half, you'll see the red skin on the outside with white rice inside. 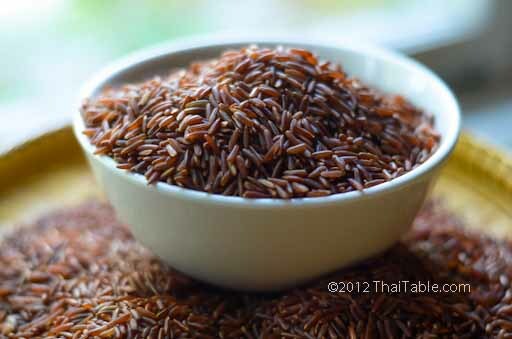 The term 'Red Rice', in Thai, is also associated with the old phrase 'Kow Dang, Gang Ron' or red rice with warm curry. This phrase refers to hospitality or a favor that's taken, but not appreciated, acknowledged nor reciprocated by the receiver. This old phrase came from the time when eating brown rice was the norm. Now milled rice or polished rice is what most people prefer. Pumpkin Curry was not one of my favourite curries growing up. As I have learned to appreciate vegetables and other ingredients and taste them for their pure flavors, Pumpkin Curry now ranks high in my kitchen. The sweetness of the pumpkin contrasts with slightly salty curry. Each bite is full of creamy, nutty pumpkin with spicy sauce. Every Fall, I look forward to pumpkin curry. The difference between pumpkin and squash seems to be which side of the pond you reside. Even though, I’m on the side that should go for 'squash', pumpkin gives the fairytale association. This fairy godmother will not turn the pumpkin into a coach for you to attend a party but she can turn pumpkin into pumpkin curry for your potluck. Any type of pumpkin or squash is great with this recipe. In the picture on the right, I use fairytale pumpkin, also known as muscat squash. However, in the step-by-step pictures below, kabocha squash was the choice for the day. The fairytale pumpkin cooks much faster and has bright orange color, like carrots. The kabocha is denser with bright yellow flesh. My preference is the kabocha because its flavor is closer to the Thai pumpkin. When I was at a rice field in Thailand, I saw these beautiful ivy gourds hanging from a fence. Before I was done taking pictures, my mother's hand had reached to pick them. We came home that day and made tindora curry. So, when I was at my local Indian store and saw tindora, I jumped at the chance of making the curry. 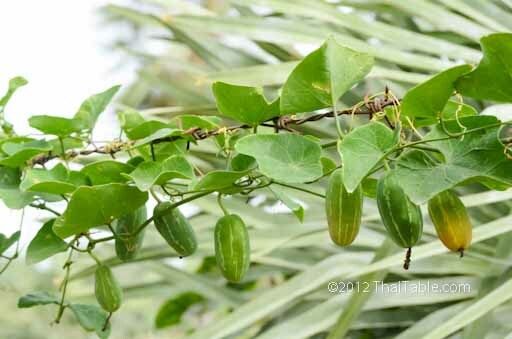 Tindora or Ivy Gourd is not a common ingredient that you would find at a market in Thailand. The ivy gourd leaves are more a common and available at any market in bundles. Most Thai people probably don't know that the green fruit is edible. The only way to get to enjoy this wonderful curry is to forage for tindora and make the curry yourself. Fortunately if you live in the US near an Indian/Pakistani market, you will see fresh tindora/ivy gourds from time to time. The fruit that's available here in the US is the non-bitter ones where in Thailand they are notoriously bitter. Tindora gives the curry a slight crunch that you normally don't find in a vegetable that's cooked in a curry sauce. The curry is thickened with crab meat and lacks most of the soupy liquid many other curries have. 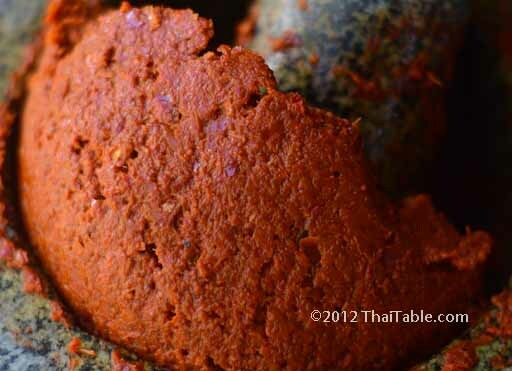 Southern Red Curry Paste has similar ingredients to basic red curry paste of the central plain. The Southern version is hotter because of the amount and the type of chili peppers. In central plain, the basic red curry paste uses larger and milder chili peppers. The Southern Red Curry Paste has fresh turmeric which adds bright yellow to the curry. I'm a great fan of southern Thai food and love making southern food. 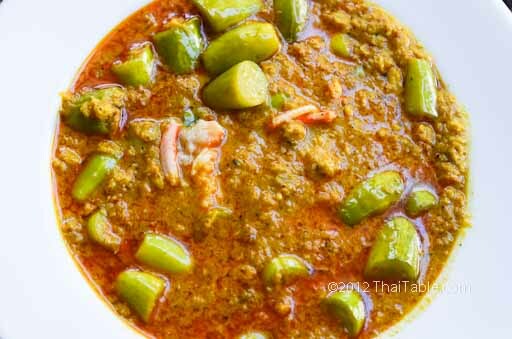 This curry paste lets me cook other delicious southern Thai dishes like kua gling. The Southern Curry Paste, as far as I know, is not available in the US. However, it can be made at home. 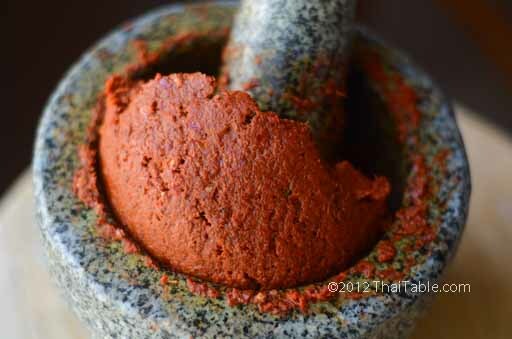 Southern Red Curry Paste has similar ingredients as its central plain counterpart, basic red curry paste. The exceptions are the addition of fresh turmeric and peppercorns and the omission of cilantro roots. This curry paste is bright red because of the dried peppers and fresh turmeric. The heat comes from both the chili peppers and the peppercorns. People who love southern Thai food know how fiery hot southern food normally is; this curry paste is no exception as it's made with dried Thai chilies, the small hot peppers. However, in this recipe, you have a choice of using the fiery hot chilies or the milder ones. This Southern Red Curry Paste can be used for making several popular dishes such as kua gling, snail curry and fish gut curry. Ivy Gourd, also known as scarlet-fruited gourd, grows wild throughout Thailand. After the rains, it often grows and sends out long shoots along fences. The young leaves and shoots are popular in soups and stir fries. In Thailand, people eat the fruit, but not as frequently as the leaves, so while you see the leaves at markets, you rarely see the fruits. This differs from the US, where you can find the fruit at Indian markets under the name Tindora, but never the leaves. While the plant belongs to the cucumber family, the flavor is richer. The fruit is green with whitish stripes going from end to end, similar to a watermelon. In fact, it looks like a miniature watermelon. It's about 2 inches in length and ½ inch in diameter. The fruit ripens from the inside out. I took this picture on the right before I picked the gourds. They were mostly green. Just overnight, 2 of them turned bright red. The ripe fruit is soft and sweet while the green fruit is bitter. There are actually 2 varieties: bitter and non-bitter. The variety common in Thailand is the bitter one. The variety we've found at the Indian markets in the US are not bitter. I first saw Ivy Gourd growing wild in Hawaii. After some research, a USDA webpage shows it also grows in Texas and Florida. The plant is a climber and regarded as weed. In Thailand, we control this type of weed by eating them! To prepare the gourd for cooking, it's cut cross sectional and wash with salt and water to remove the bitterness. The most common way of cooking is to add it to curries.